Climbing in a breathtaking scenery. 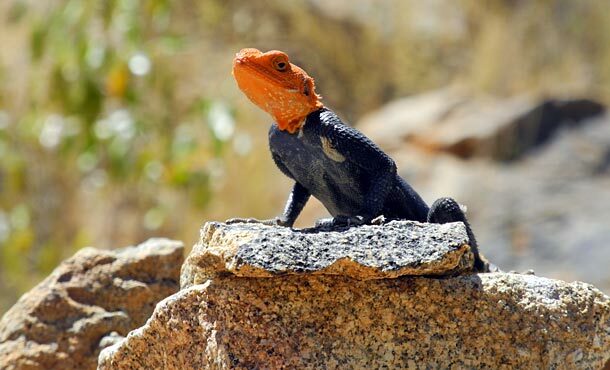 Now we are on the road to the Spitzkoppe after a few days of acclimatization at our friends house in Windhoek. It is our first destination, and also planned highlight of this trip. We have prepared everything thoroughly for this climbing adventure and loaded our 4WD Toyota Hilux with food and water for over a week. 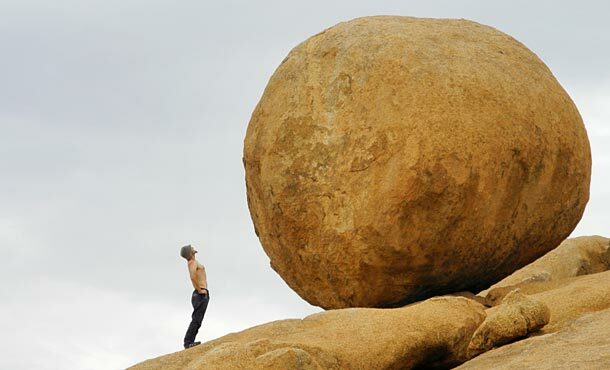 In Usakos, the last town before the Spitzkoppe, we fill our inventories even further. 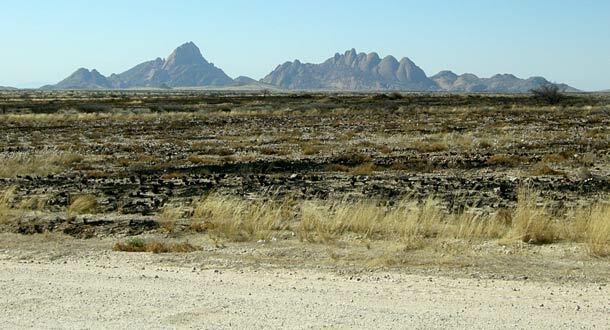 From here it is only desert landscape without additional infrastructure. 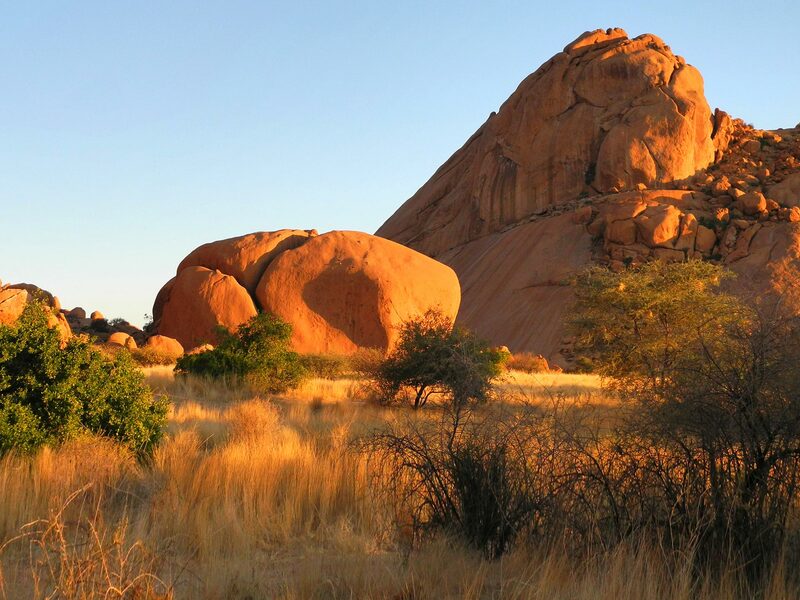 The area around the Great Spitzkoppe is dreamlike: everywhere countless boulders, fantastically located campsites with views of the surrounding rock faces, interesting crack systems and friction slabs. By the time we arrived in the Boulder Valley, a heat wave with maximum temperatures ​​up to 47 °C reached the area to our surprise. We didn’t expect such hot temperatures. 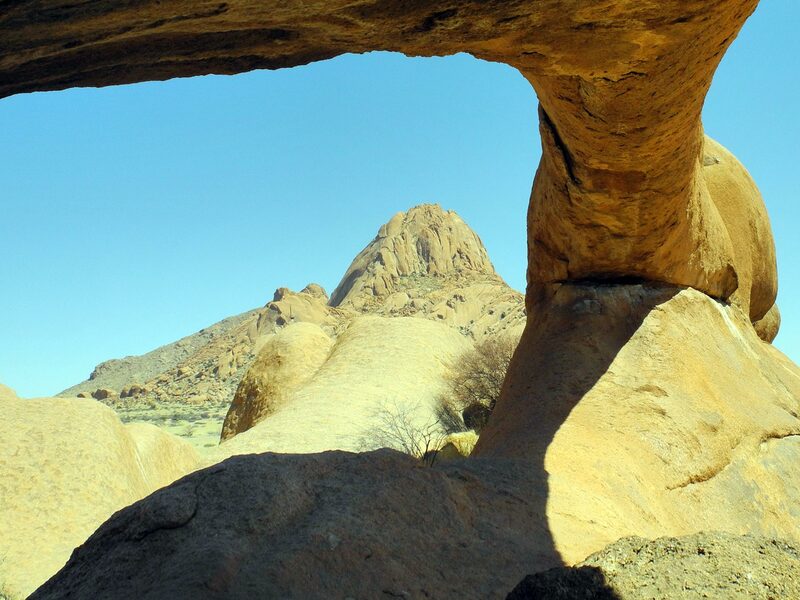 Actually, the domes of the Spitzkoppe and Pontoks should be the highlight of our trip. 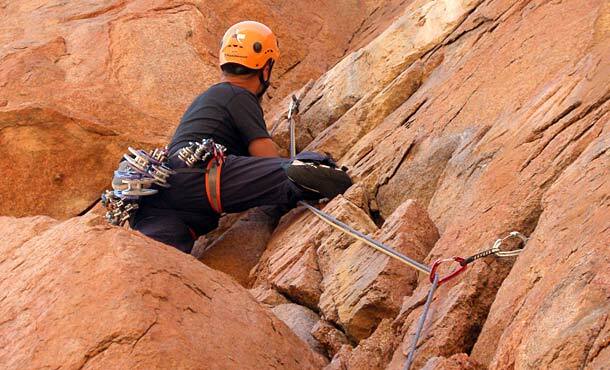 Here we wanted to climb some of the longest routes in Namibia. But it came to nothing. Our first attempt to climb the Schreiber route on the west face wasn’t successful. After two arduous hours, we ended up at the top of the Hippo Rock, not even at the start of the climb, as we were forced to turn back because of the relentless sun. The next day we try our luck at the Pontok peak. Our goal: the route “To bolt or not to bolt”, eight pitches of chimneys and slabs up to the summit. After an approach of one and a half hours and three really great pitches, our throats are totally parched, so we have to rappel down. It was too hot. The day after we scale down the expectations and climb on the rocks of the Sugar Loaf: but the slabs of the giant granite domes heat up like hotplates, and we immediately slip with our climbing shoes. It is hard to believe, but not even the easiest routes are feasible for us there. Under such conditions the climbing just doesn’t make sense. The fascination about the magnificent rock scenery and also the disappointment about the current climbing-conditions are so close together that our thoughts feel like a rollercoaster. 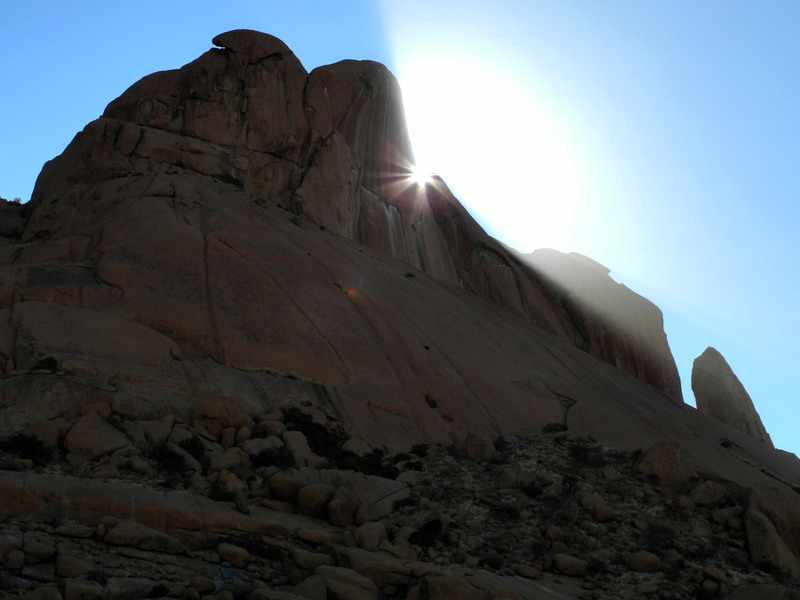 With a heavy heart we decide to swap places and leave the Spitzkoppe after five days behind us. 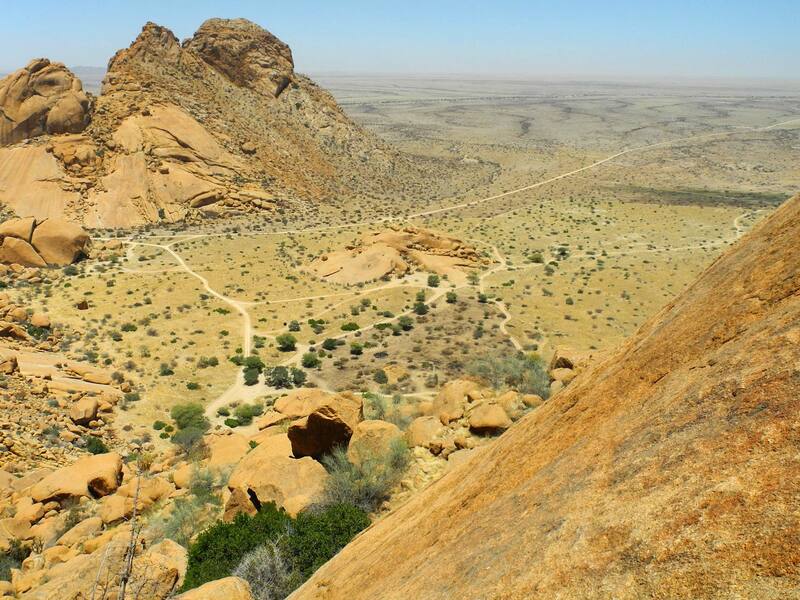 Our next goal is the Ranch Ameib in the Erongo Massif, where we hope for steep rock walls with more shade. 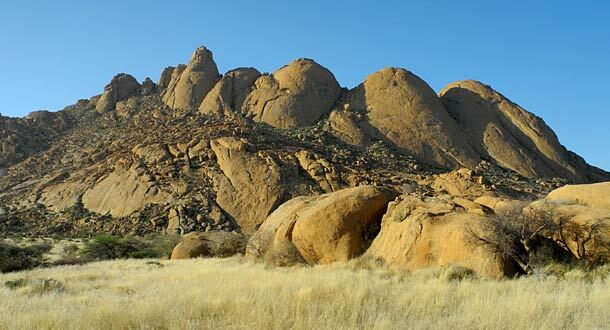 The Great Spitzkoppe is situated 280 km northwest of Windhoek, about four hours by car. Usakos along the road is the last stop to replenish water supplies and food (there are no shops in the whole Spitzkoppe area). You can look after your favored campsite in the whole area, once you have entered and payed the fee at the entrance to the Park. 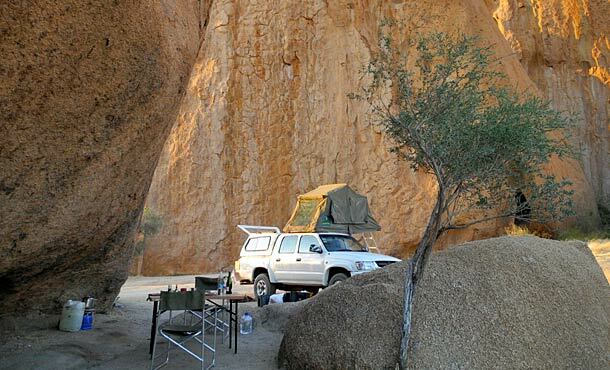 The most beautiful campsites in my opinion are in the Boulder Valley underneath the southwest face of the Spitzkoppe. 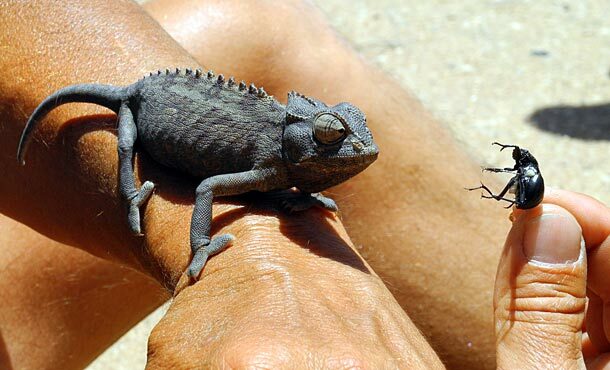 The african winter offers the lowest temperatures for climbing, but although the most traffic in the Park. In November the Park is quiet and empty (eight visitors in average per day), but it can be very hot – we have been through! September and October as well as May offer probably the best time for climbing. Chimney-, crack- and slab-climbing in multi-pitch trad routes are the dominated climbing styles at the Great Spitzkoppe and the five Pontoks. There are also a few drilled baseclimbs at the Sugar Loaf and at some bigger boulders.  Nevertheless, Namibia asked more of the risk-taking adventurer, the country is less suitable for the classic sport climber. 60 m double rope, 1 set of Stoppers, 1-2 sets of C4-Camalots up to #6 (large sizes are an advantage).